Our range of quality manufactured Pulsed and CW Fiber Lasers can be used for cutting metals, graphite composites, ceramics, gemstones and plastics. Our global applications labs can also assist you to source the most efficient Fiber Laser solution(s) to meet your specific requirements. Capacity for high degree of beam manipulation (true 3D cutting). 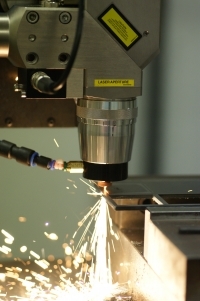 For Laser cutting, the beam must be focused by a lens to a small spot size, typically 25-100µm in diameter for fine cutting and 100um to 300µm diameter for thicker section cutting. Coaxial gas is delivered just above the Laser focus by a nozzle that surrounds the Laser beam. This helps to keep the optics clean and improves the cutting process by pushing vaporised and liquified material out through the kerf. Gases such as oxygen and air are used to promote the cutting of ferrous alloys and cellulose materials. Air is often used with plastics. High-pressure inert gas is used when cutting some metals to leave an unoxidised edge with little dross. The Fiber Laser’s beam quality allows very fine Laser cutting with kerf widths possible of less than 20µm in thin section metals of <200µm thickness (foils). With such a fine kerf, cutting speeds of 10m/min are possible in a range of metals, ceramics and semiconductor materials such as silicon. 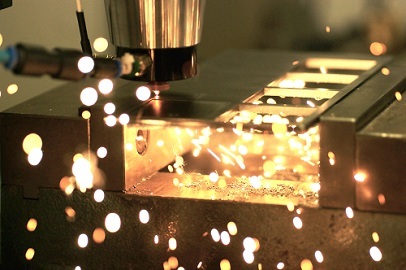 With the possibility of modulating the beam at high frequency and fast response times, high speed Laser cutting of small features is possible with very high accuracy and repeatability. Our range of redPOWER multi-kiloWatt Fiber Lasers make it possible to cut much thicker materials. For example, they can be used with different diameter processing fibers from 100µm to 300µm for cutting and welding sheet metal. It can cut thick low carbon steel (LCS), aluminium alloys, stainless steel (304SS) and reflective metals such as copper and brass.